A few months ago, just after Pegasus Falling had been released, my nan (William’s wife, Sheila) thrust a small, unassuming plastic envelope in my hands, proclaiming that she’d found it in amongst an old pile of Gramps’ stuff. In it were three very interesting items. Firstly, there was a short, typed memo from Gramps to ‘Kate’. This is my mum – her real name isn’t Kate, but her initials are K.T, so Kate for short. Dated 2.10.92 (for my American readers, that’s October 2nd, not February 10th! ), it introduced a short story hot off his new word processor. Gramps retired in 1990. He soon became bored with the life of a pensioner and decided to set himself the challenge of writing a book. He called his first work simply ‘Opus 1’. I had read it back in 1992 (at the grand age of 13) but had not laid eyes on it again until now. Set in a part-Courier typewriter / part-computer system typeface, the manuscript ran to just 20 pages, loose leaf and unformatted. It was just as he had written it, un-fettered and undisturbed for many years. 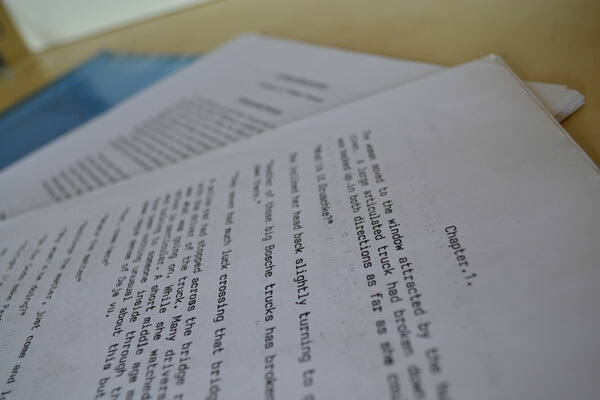 The third piece in the plastic envelope was a much larger loose leaf document – a synopsis and abstract from The Cypress Branches, the document William had sent to publishers on his brief attempt to publish. All three are fascinating items in themselves. I wish I had seen the synopsis and abstract years ago, when I first set out to edit the books. Although written for a different purpose, it provides an insight into how William saw the novel work. Thankfully, it looks like my changes work within the context of his vision, but a lot of difficult decisions would have been made easier with this document to hand. The memo is poignant, to say the least. Although it is a simple note, its style is as efficient as William’s prose, declaring that “I’m still feeling my way with this” and that he had to “exploit a direct experience”, asking for, “some objective comments please”. Opus 1 itself is a revelation. The memo goes on to say, “of course there is some artistic licence and more than a suspicion of hyperbole, but the tale is in general, true.” As with his subsequent work, William drew on many and varied incidents from his own life and weaved them together into a gripping and heartbreaking work of fiction. 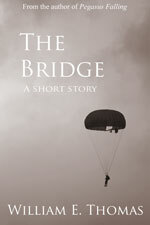 It is the story of a romance between a British Parachute Regiment sergeant and a Dutch girl whose house is taken over by the army and turned in to their HQ for the ensuing battle to secure the bridge. William was a paratrooper, and at the age of 18, was involved in the ill-fated operation to capture the bridge at Oosterbeek, near Arnhem in Holland – the fabled Operation Market Garden which ended so badly for the troops involved. William was one of the lucky few who managed to escape back home and tell the tale. Many of his friends were not so fortunate. Although Opus 1 was initially written as a standalone work, elements of it ended up becoming part of William’s much larger work, The Cypress Branches, which he started to write almost immediately after completing his first short story. Although it underwent a considerable amount of editing and the story was changed to integrate it into the longer storyline, some readers will recognise it as forming the basis of the first chapter of Pegasus Falling – part 1 of the Cypress Branches trilogy. They’ll also recognise the sergeant, the main character in Opus 1 who plays a smaller role in the story of Pegasus Falling. Opus 1 is a fantastic introduction to William’s work – it reflects his style and the characters are just as well-written as those in The Cypress Branches. So, I have built it into a stand alone ebook and it is now available to download for free from Smashwords, Kobo Books and acuteanglebooks.co.uk. Despite its quality, Opus 1 was never, to my knowledge, meant for publication, so William never gave it a proper title. I have named it “The Bridge” – which seemed simple, fitting and appropriate. May Newsletter – Bank Holiday Ebook Giveaway & We Need Your Reviews! Welcome to the May newsletter. In this edition, we’re asking for your reviews, and also giving you the chance to download the ebook for free. It’s been a busy month following the release of Pegasus Falling, and it looks like it’s going down very well with readers everywhere. As well as being in stock at amazon.co.uk, the paperback is also now available at Waterstones in Midsummer Place, Milton Keynes and Rye Books in East Dulwich, London. We’re keen to support local bookshops and we’d encourage others who feel the same to pick up their copy of Pegasus Fallinglocally. Even if it’s not in stock yet at your local shop, most should be able to order it in easily if you provide them with the ISBN number (978-09562299-1-5). The ebook is also now available widely and, thanks to smashwords.com, for virtually any device. As well as amazon.co.uk and amazon.com, you’ll also find it in the iBooks store, kobo.com and diesel-ebooks.com with many others to follow. We were thrilled when William and the book were featured in the Milton Keynes Citizen a few weeks ago, with an article appearing on the inside front cover, much to our surprise and delight. 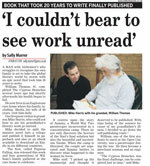 If you don’t live in the area, or missed it at the time, you can read it online here. We’ve already had a handful of reviews on Amazon (take a look here) and several bloggers have agreed to read and review the book, so keep an eye out for their thoughts in the coming weeks. It can not be underestimated how important reviews are to people – especially when they’re buying a book by an author they don’t know. Please be honest and say what you liked and didn’t like about the book. If you thought it was wonderful and worthy of 5 stars, then great. But if you thought it was only worth 1 or 2 stars, then that’s fine too – but please explain why. As long as you’re honest, your comments will help others who are happening upon the book to make their choice. Your review doesn’t have to be long – just a sentence or two will do. It’s a bank holiday weekend and with the weather looking typical for a British bank holiday, it looks like getting stuck in a good book is the order of the day. So, we’re making Pegasus Falling free to download at smashwords.com where you can download a copy of the ebook suitable for any ereader or for reading on your PC. Head over there and use the coupon code SF42B for a 100% discount. Feel free to forward the code to your friends and family – this offer is open to all – but the coupon expires on Monday evening, so hurry! Before I sign off, some of you may have heard that William’s wife Sheila is recovering in hospital after suffering a stroke two weeks ago. I’m sure you’ll all join us in wishing her a full and speedy recovery. A newsletter was sent to the mailing list this morning to announce the launch of Pegasus Falling. Here’s what was sent. To join the mailing list, send a message to contactusATacuteanglebooksDOTcoDOTuk. Launch day has finally arrived and Pegasus Falling is now available as a paperback and ebook. Yesterday, we held a small party at the care home where William is now resident, so that the man himself could be included in the celebrations. A massive thank you to those involved in putting the day together and to everyone who attended for giving the book a brilliant launch. Pictures of the day can be found on the website here. We plan to make Pegasus Falling available as widely as possible and you have a plethora of options for where to buy it. And if you haven’t made up your mind whether to buy it yet or not, you can download samples from both the paperback on the acuteanglebooks website and the ebook at Smashwords (follow the links below). The paperback is available now to buy online from www.acuteanglebooks.co.uk/pegasusfalling and if you order before 30th April 2012, you’ll get the ebook as well for free. It can be ordered from Amazon and Waterstones. It is also available to buy through the Facebook page – www.facebook.com/pegasusfalling. We’ll be approaching high street retailers over the coming weeks, including big chains and local bookshops, to see if they’d like to stock the book. In the mean time, if you’d like to buy from your local shop, they can order it from their wholesaler by quoting the ISBN number – 978-0-9562299-1-5.
Pegasus Falling is also available as an ebook. This is a very exciting prospect as the e-reader phenomenon takes hold. We’ve priced the book very competitively and will cost as little as £1.53 in the UK, EUR2.60 in Europe and $2.40 in the US (depending on the addition of VAT). Kindle – download at the Amazon Kindle store in the UK, US, Germany, France, Italy and Spain. Smashwords – head to www.smashwords.com to download the book in a range of formats which are suitable for any reading device or for reading on your computer. It’s an American site, so prices are in US$, but you can buy from anywhere in the world using PayPal (they’ll do the currency conversion for you). It’s a great site in itself with a huge range of interesting and unusual ebooks published independently. The ebook will be made available through other ebook retailers in the coming weeks, including the Apple iBook store on iTunes and Kobo. Keep checking and it should appear shortly! We’re now about to plug the book for all its worth to generate interest and excitement. We’ll start with the local press and social networking sites and work our way up to the national press over the coming weeks and months. But there’s nothing like word of mouth to get the buzz started, and there are a number of ways you can join in and help us spread the word. If you can do any of the following, we’d be incredibly grateful! Like the facebook page – Next time you’re on Facebook, have a look at the Pegasus Falling page. Clicking “Like” will not only show all of our updates in your newsfeed, but also help us spread the word around Facebook. The more likes we have, the better our chances of success. Feel free to join in and leave comments and messages on the page. Leave a comment – use the comments box at the bottom of the page in the shop to tell us (and your friends!) what you think of the book. Follow us on Twitter – follow @cypressbranches for updates and use #PegasusFalling to talk about the book. We’re getting followers from all over the world, which is fantastic. Rate us on Smashwords – leave your star rating and help us raise the book’s profile on the site. Tell your friends – if you’ve enjoyed the book, let your friends know! Tell us – email contactusATacuteanglebooksDOTcoDOTuk to let us know your thoughts. Please mark your email “Not for publication” if you’d prefer your comments not to be used in our publicity. Once again, a massive thank you to everyone who’s bought a book (or plans to) and for all the support we’ve been given over the last few years.